If Halloween happens to fall on a school day, then I always make the effort to dress up for my students. One year I dressed up as Raggedy Ann. This costume had my students a bit baffled. They've never heard of Raggedy Ann!!! I ended up having to show pictures of Raggedy Ann on the internet to my students. Once I had shown them who Raggedy Ann really was, they were all smiles. Then, the following year I dressed up as Dorothy from the Wizard of Oz. I even had the sparkling red shoes and a basket for little Toto. My students kept reminding me all day to stay away from those who had dressed up as Wicked Witches. The following year we read the book "Miss Nelson is Missing" by Harry G. Allard. So, of course, I had to dress up as Miss Viola Swamp. My students kept asking me if I was going to pretend and be their mean teacher for the day. We had such great laughs because every once in a while, I would sternly ask my students to behave or sit down. Then, the next year I dressed up as Miss Smartie Pants. My students loved my costume and wanted to know if I had eaten all of the candies. This year, again I wanted to create a costume with a "play on words". However, I wanted to put my own twist on it. I wanted to use clip art in my costume. As you already know, there are tons and tons of wonderful, colorful, and creative clip art images on the internet. And, since I already own a few too many, I wanted to put a couple of these images to good use. I chose these wonderful, cute little monsters along with these adorable cookies. Then, once they were all printed and cut out, I laminated them for durability. The next thing I needed was to buy a blue T-shirt from Michaels. Of course, as I'm walking down the ailes looking for the T-shirt section, I come across these big googly eyes. Who could say no to those eyes!!! My costume was going to be just perfect with those eyes! Once I got home, it was time to create my costume. All I had to do was hot glue the eyes and the clip art onto the T-shirt. More clip art on the back of the T-shirt. And, there you have it! This year, I will be Cookie Monster. I'll put on a pair of jeans and my blue, curly wig to complete the ensemble. A bunch of us bloggers have come together to host a Back to School Giveaway. 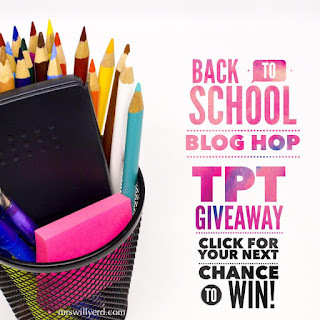 We are each giving you a chance to win a $10 TpT Gift Card. 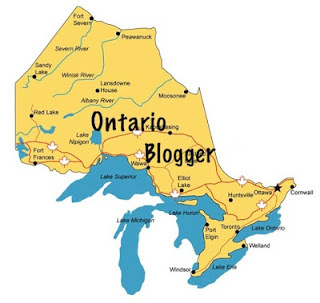 All you have to do is hop from one blog to the next and enter the giveaway that's being hosted on each of the blogs. 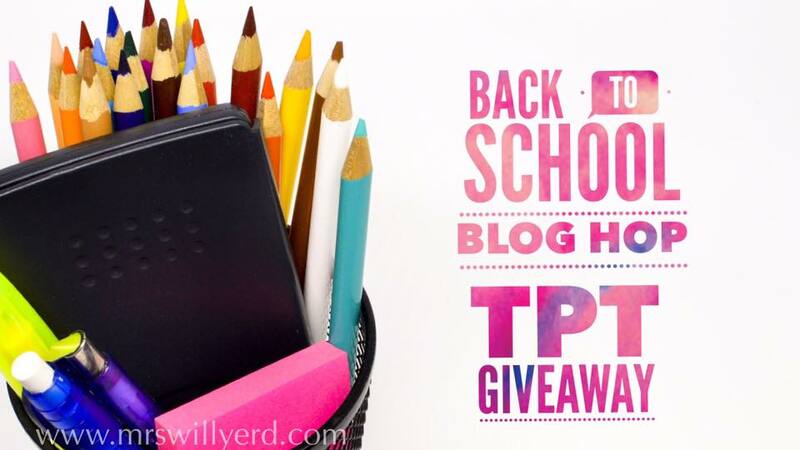 So, just imagine, if you visit 10 blogs and enter in 10 giveaways, you have a chance of winning a $100 TpT Gift Card. So, let's get started. Enter the Rafflecopter below. Then, hop on over to Reading with Mrs.D's blog and enter her giveaway. Good luck! In order for learning to take place in a warm and welcoming classroom environment, it is imperative that some sort of classroom management is in place. Now, I know that there are many different classroom management strategies out there. Choosing the right classroom management tool will not only depend on the dynamics of your classroom, but also on your own teaching style. For the past few years, I have simultaneously used Table Group Points and Class Dojo. My students love Table Group Points because at the end of each month, I have the winning team visit my special Treasure Box. They get to choose either a special toy, pencil, fancy eraser, etc. from my stash of goodies. By the end of the school year, I ensure that each student has definitely had a chance to visit my Treasure Box at least once. My students love Table Group Points because they know that on the first of each month, they will get a new seating partner. The morning of, you can see the look of excitement on their faces because they can't wait to find out as to where and with whom they will be seated with. Once they are all seated, I then announce that month's group names. The names will usually be words that I pick from our unit of study for that month. So, for example, if that month we are studying about Plants, then our group names would be: Loam, Silt, Sand, Clay, and Humus. Or, if we are studying shapes in Math, then our group names would be: Quadrilaterals, Parallelograms, Hexagons, and Pentagons. I use these group names all throughout the day. For example, I might say, "I like the way the Hexagons are sitting. They may line up!" Or, I might say, "The Silt group will work on their projects out in the hallway, while the Sand group works on their iPads on the carpet." We keep tally of our points on a designated spot on the blackboard. Let me tell you, students definitely take pride and ownership when it comes to their points. I could go on and on about our Table Group Points, but I think I'll save that for another post. 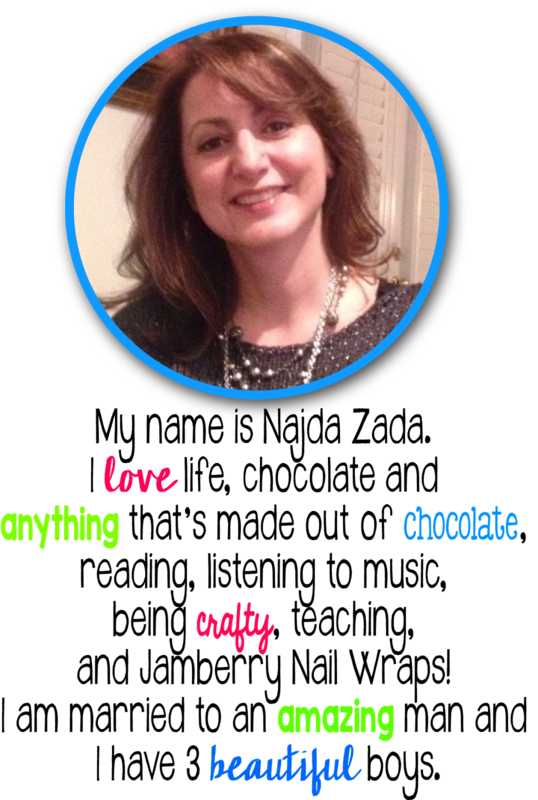 We also love Class Dojo because my students enjoy earning individual points. And, like the Table Group Points, I award prizes, but this time to only those three students with the highest scores at the end of each term. These tools are amazing and have always done wonders to the atmosphere of my classroom. However, this year, these two tools were just not enough; especially for one of my students. I tried everything with this student. I mean, everything!!! This student just wanted to be the center of attention. I needed to think of a strategy that had immediate results. I needed something that did not take a lot out of my time because this student's behavior literally consumed our whole day. Teaching and learning was not taking place. You get me?!?! I needed something that was going to encourage positive classroom behavior, and discourage defiant behavior. I am so excited to share with you a strategy that is cheap, easy, and successful! We all have them. We all love them. We can't get enough of them. Every morning, our Special Helper of the Day places a sticky note at the corner of each desk. These sticky notes are only given to those students who are present. Those students who are absent or arrive late to class would not get a sticky note on their desks right away. However, if a student does arrive late to class they would give me their Late Slip, which they would pick up from the Main Office, in exchange for a sticky note. Students love getting fancy sticky notes. They come to class all excited and looking forward to their next fancy sh-mancy sticky notes. Once students receive their sticky notes, they then write, "I had a good day today!" along with their name. In the beginning, I was constantly writing on the blackboard "I had a good day today!". However, as the weeks wore on, there were days that I would forget to write this quick and easy simple sentence on the board. My students would quickly remind me of that, that's for sure! So, I created a variety of posters. I attached magnetic tape on the backs of these posters and used them interchangeably on my whiteboard. And, since I was teaching a French Immersion class, I made some posters in French, too. Easy! As I walk around the room, helping students with their work, I might either bring along with me a bunch of stickers, stamps, a cute teddy bear hole puncher, or a colorful pen; whatever I can quickly grab on that day. When I notice that a student is demonstrating positive behavior, or has learned a concept, I would immediately praise them with a reward. You should see their faces when they get a stamp or an initial from me! I just love making my students happy! Sometimes, the stamp fairy also comes along and stamps their sticky notes while they are away during lunch or recess. Remember, good behavior could be anywhere, at anytime. As long as students display good character, they are always rewarded. My students love earning these simple rewards. They really try their best because they want to fill their sticky notes with as much goodies as possible. I just love this strategy. It engages students and they really enjoy earning their stamps, stickers, or decorative hole punches. As you can see, this student has received 6 stamps and 1 sticker. And, since I do not want my students to be distracted by these cute sticky notes, they were asked not to touch them. If a student was caught playing with their sticky note, their sticky note would get confiscated. I never had to confiscate a sticky note, ever! In all honesty, I mentioned this rule only once to them and they took me seriously. Who knew, that a simple sticky note would have such an affect. What happens if a student is off task? Their sticky note would get confiscated. They would have nothing to collect. In actuality, I only had to confiscate it twice. My students made sure that their sticky notes stayed right on top of their desks, and not on mine. Can they get a new sticky note after their first one has been confiscated? After awhile, if they demonstrate good behavior half way throughout the day, then yes! However, rather than having them write, "I had a good day today!" on their new sticky note, I would write it out for them instead. The reason I do this is because at the end of the day, students are allowed to take their sticky notes home and share their good day with their families. However, if a student takes a sticky note home with my handwriting on it, then this signals the caregiver that the student had a mediocre day and that they were given another chance. What happens at the end of each school day? Students take their sticky notes home to share their good day with their family and friends. How do students transport their sticky notes home? The end result was that my students were able to demonstrate good character, while having fun learning all of the grade level concepts! Most importantly, my defiant student was no longer defiant. And, the rest of my students ended up having a wonderful keepsake along the way. They kept their sticky notes like a daily diary and couldn't believe as to how many good days they've had throughout their 2015-2016 year! A win-win situation for all of us indeed! So there you have it! A cheap and easy strategy that can be easily implemented in your classroom. And, since you stuck with me to the end of this post, I have a freebie for you. You can download my "I had a good day today!" 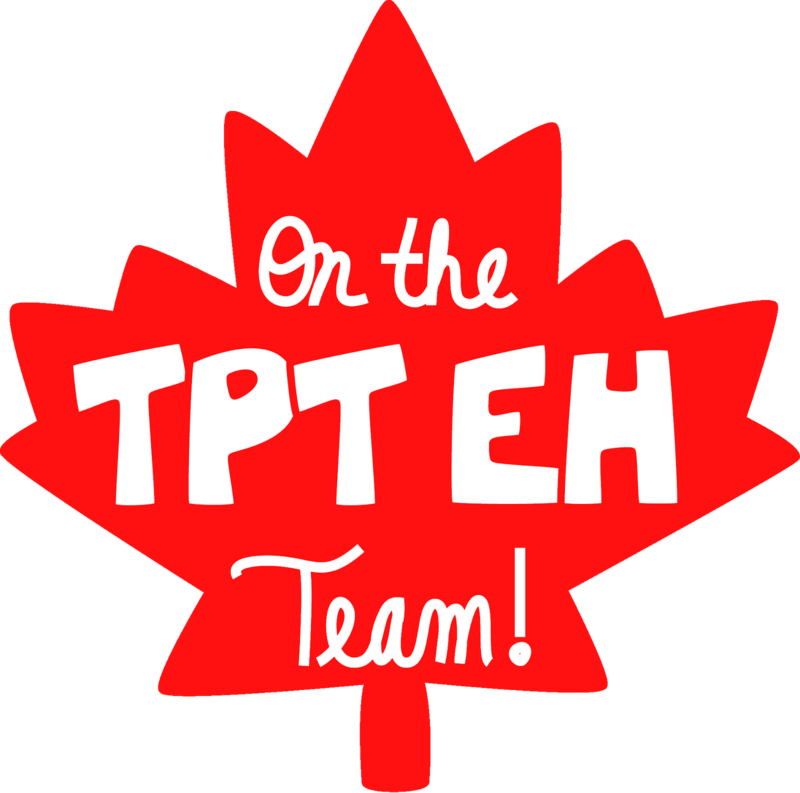 posters from my TpT store, click here. 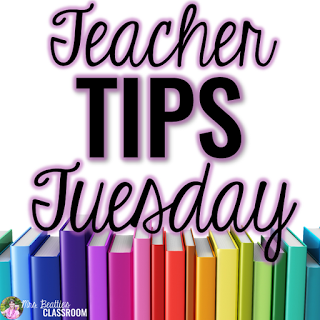 I'm linking up with Erin from Mrs. Beattie's Classroom for her Teacher Tips Tuesday linky. Thanks Erin for hosting! From time to time, I have my students show me their learning on plastic plates. My students love writing on plastic plates. Plastic plates just engage every single student; even the reluctant ones. There are a variety of ways that you can use plastic plates, however one way that I use plastic plates is to project my questions or task cards onto the screen. Students respond to the questions onto their plates with a dry-erase marker. they hold up their plates for me to quickly see and assess. then it immediately becomes a teachable moment. What quick and engaging assessment strategies do you use? Thanks Erin for a great linky!